Okay, I’m listening. Tell me more. 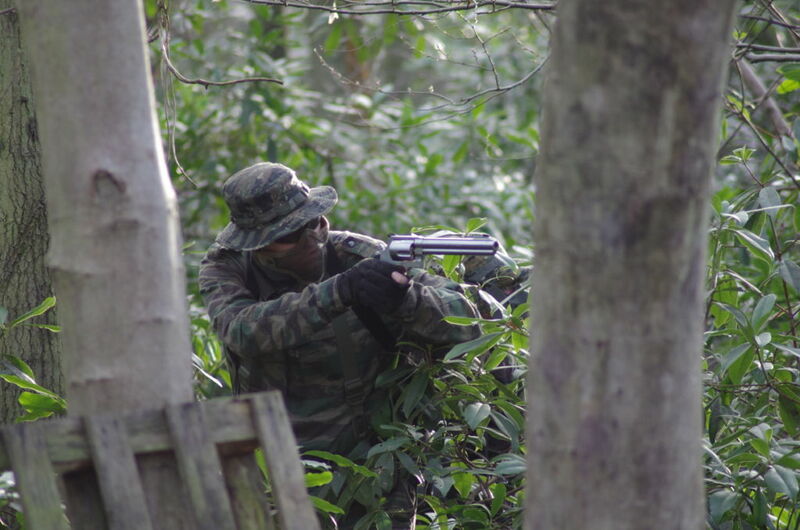 Airsoft is, in the authors’ opinion, “Paintball for grown-ups.” An airsoft gun is a full size replica of a real life gun. Many people collect them as they represent high quality replica models of otherwise unobtainable firearms. 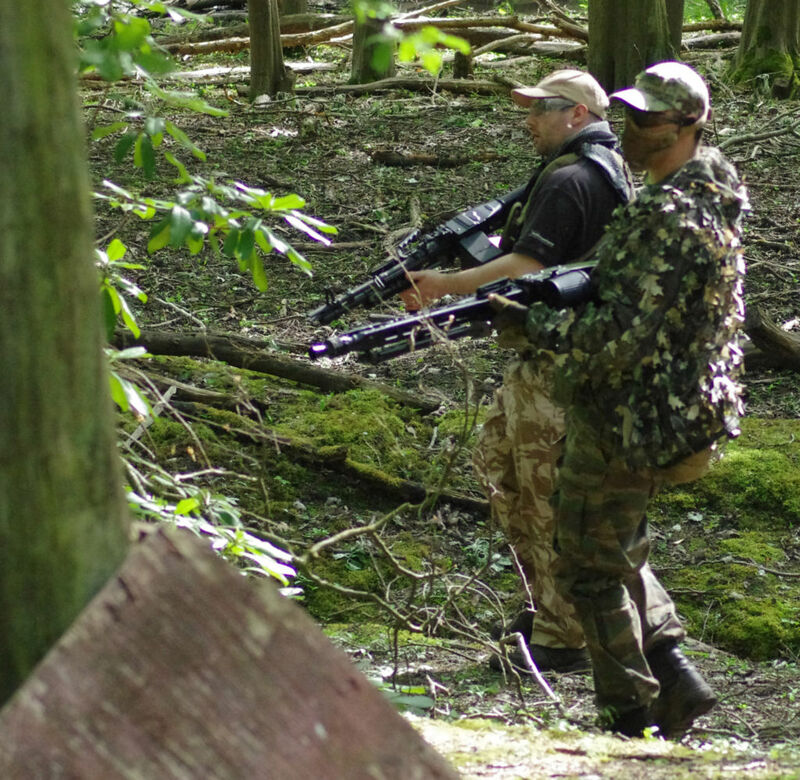 Others get dressed up in camouflage gear and run around private grounds shooting at each other. This is known as a “Skirmish” or “Skirmishing”. 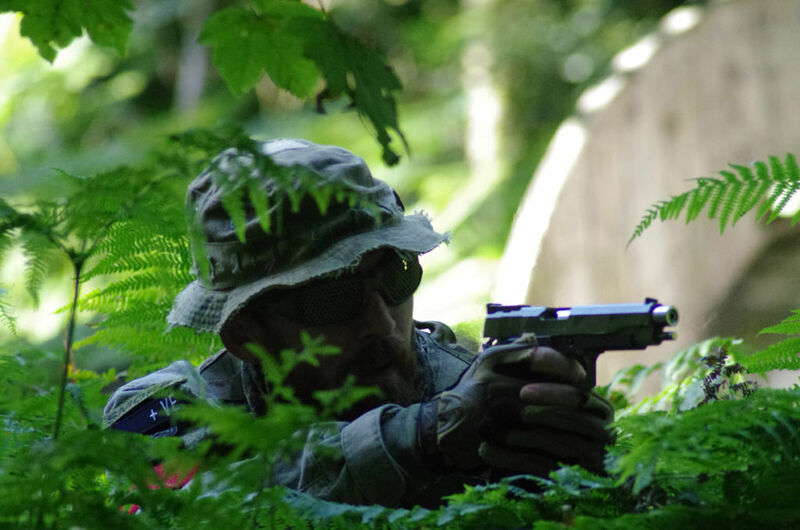 Originating in Japan, and now popular all over the world including Asia, the United States and Europe, Airsoft has branched out into, and been embraced by, the Corporate Leisure industry while keeping it’s niche popularity with its fans. The film and television industry also use airsoft guns as they provide lifelike replicas that are much less dangerous than the real thing. If you look carefully at the pilot episode of Stargate SG1, for example, you will see they were using Airsoft guns as props. The ammunition used in airsoft is a small 6 mm diamter plastic ball known as a “BB.” Airsoft BBs are not the same as the 4.5 mm steel balls that BB Air guns fire, nor the 4.6 mm (0.180 in) “BB” size lead birdshot from which the term “BB” originates. Contrary to popular belief BB does not mean “Ball Bearing”. Cool. What about the shooters then? Most modern guns (and many less modern) have their airsoft analogues. They fall into 3 main categories and are differentiated by the type of gun and the mechanism they use to fire the projectile. Quality can vary considerably from gun to gun and manufacturer to manufacturer. As a general rule of thumb the more metal used in the fabrication of the weapon the more durable and robust it will be. The most popular type of airsoft gun for skirmishing is known as the AEG, or Automatic Electric Gun. The first AEGs were made by the Japanese Manufacturer Tokyo Marui (usually known as TM). TM have produced copies of most of the automatic rifles that are in use around the world today. Since TM made the first AEG many more manufacturers have appeared: Cyma, G&G, ICS, VFC, KWA, WE, Krytac and ASG to name but a few. There are now airsoft versions of the Russian Kalashnikov AK series, through the space age Austrian Steyrs and Belgian FN’s to the ubiquitous Colt M16 / M4 and an almost complete range of German Heckler and Koch’s. Even British favourites like the SLR / L1A1, Sterling SMG, STEN, the SA80 / L85 / L86 and the L119A1 are available. Everything from sub-machine guns, through assault rifles to light and heavy machine guns are available. There are even Airsoft miniguns. AEGs use a combination of a pneumatic piston, gears, a motor and electric systems to produce a fully automatic gun. Manufactured typically of a combination of plastic for the moulded parts and metal for the moving and mechanical parts. The magazine capacities of these guns are often much bigger than the original “real steel,” as they are known, weapons. For example, airsoft AKs typically have a 600 round magazine available. The real steel AK only has a 30 round magazine. Prices range from as little as £100 to £2000 or more for a top end Systema “Professional Training Weapon” or PTW rifle. An AEG Kalashnikov. You can see the BBs leaving the barrel. Pistol users are well catered for by gas powered weapons. These are usually powered purely by stored, pressurised gas. The gas is stored, along with the BBs, in the pistol magazine. For pistols the main gasses are either CO2, in the form of 12g capsules, or “Green Gas” (essentially Propane or Propane based mixes). Gas Pistols and Rifles have many more moving parts than AEGS. Often the entire slide or bolt moves when the gun is fired, making for a much more realistic and satisfying experience. Gas Blow Back guns (GBB for short) can be as powerful as AEGs. Pistols are carried as a backup weapon or used in pistol only games, which can get quite frantic at close quarters. Most of the better manufacturers make GBB’s including Tokyo Marui, Western Arms, Tanaka, WE, KWA and KSC. Most are single shot affairs, but some are full auto. Typically a little cheaper than AEG’s, prices run from £60 to £300. Since this article was originally written GBB Rifles have become much more usable and gas efficient and there are now a significant range of models of GBBRs available from the likes of TM, WE and KWA. NOTE: CO2 powered weapons and HPA powered weapons are not allowed at Tech Brigade. A gas powered revolver blow back pistol. The photo has caught the pistol mid cycle with the slide moving. A gas powered revolver pistol. The third type of gun is the spring rifle or pistol, most commonly found as the sniper rifle. These are bolt action, single shot weapons. They are essentially identical in operation to manually cocked spring air rifles. A spring pushes a piston forward in a cylinder to propel the BB down the barrel. Due to some legislation single shot rifles can use higher power. As a result they have greater range and can be tweaked to have greater accuracy than an AEG. One can spend over £400 for the best sniper guns. Shotguns, which fire a salvo of 3 rounds, are also popular and use the pump action to compress a spring. Spring pistols and rifles were the very first kinds of airsoft guns and ruled the airsoft world until the arrival of the TM FAMAS, the first AEG. Spring pistols are puny things compared to modern gas pistols but can still be highly entertaining. A spring powered bolt action sniper rifle. A spring powered tri-shot shotgun. The 3 generic types listed above are the most common types of airsoft guns, but others such as Non Blowback (NBB) guns, Automatic Electric Pistols (AEP), compressed air and shell ejecting types are available along with many other specialist types. In the last few years Compressed air has also become a possibility for powering gas airsoft guns. Often known as “High Pressure Air” or HPA systems. HPA sees something of a return to the paintball systems where the rifle has to be connected to a remote air reservoir or tank, usually by a long umbilical hose. There are two schools of thought on HPA systems: those who love the increased shot to shot consistency or high rates of fire which HPA can provide and those who dislike the reduction in realism that having to carry around an air tank, pressure regulator and hose line introduces. There are also BB grenades but these are almost useless (wisely) due to safety/explosion restraints and should be saved for urban room clearing and small bunker clear-outs. There are even grenade launchers. Modelled around the 38 mm grenade launcher system they use “Moscarts.” These typically fire a salvo, or shower, of up to 200 BB rounds in a slightly diverging flight path. 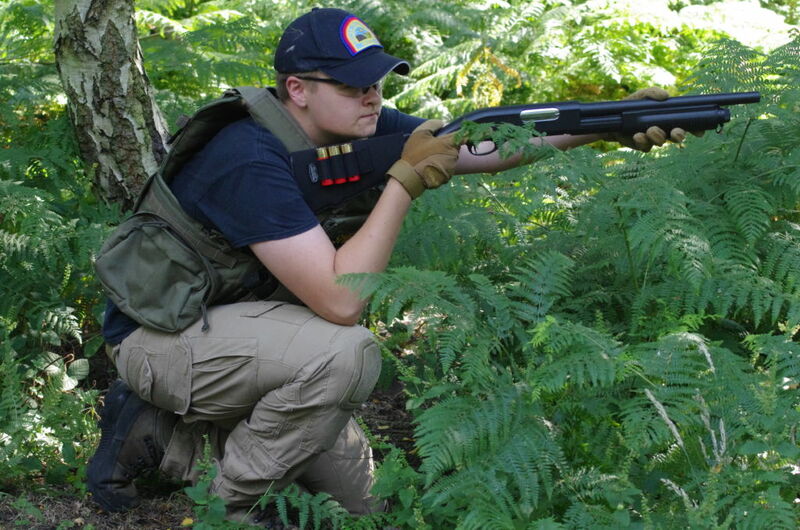 Airsoft shotguns use the same divergent technique. Moscarts are really only a very close range last ditch weapon quite unlike the real 38 mm grenade launcher. NOTE: HPA powered weapons are not allowed at Tech Brigade. How do the guns work? How does an AEG work? When the user pulls the trigger, a circuit is completed and the motor runs. Through the gearbox, the motor pulls a piston inside the cylinder back against a spring. The chamber fills with air. A mechanism pushes a BB from the magazine into the breach or hop-up unit. The piston is then released and the spring pushes it forwards. The air in the chamber is rapidly compressed and the BB is pushed at speed out of the barrel. Animation of how an AEG works. How does a GBB pistol work? (In simplistic terms) When the trigger is squeezed, gas is released from the magazine pushing the BB out of the barrel. Simultaneously a small cylinder fills up with gas pushing against a piston which pushes the slide back resetting the mechanism and reloading a BB in to the chamber for firing. The secret to the range and accuracy achieved by airsoft rifles is all down to another Tokyo Marui invention. Modern guns impart backspin to the BB in the barrel, by means of a mechanism called Hop-Up. The backspin is applied by squeezing the BB under a rubber pad known as the “Bucking”. By applying more or less pressure to the bucking, through a pad known as the “Nub”, more or less backspin can be applied. The backspin makes the round fly further by giving the BB lift to counteract the force of gravity. The effect of hop-up adjustment. The effect of getting lift from backspin is called the “Magnus Effect”. A correctly adjusted HOP makes the round fly in a stable manner without losing height until almost the end of its flight, at which point it drops off quickly. The adjustment of hop-up and the selection and discussion of the best hop-up parts is a huge subject worthy of it’s own dedicated website. What is a “Skirmish” then? People who have played Paintball are struck by the similarities that Skirmishing has with that sport. Often, they are also surprised by the differences. A skirmish is an organised game, or series of games which take place over a day (or more than one day). Basically, the players split up into two teams and compete against each other. Objectives vary; King of the Hill, Hostage Rescue, Blow the Bridge are all common examples. Players try to shoot their opponents to take them out of the game. Shot players have to remove themselves from the arena of play for a short period by returning to a nominated place before they can return to the game. As you can imagine, safety is paramount so eye protection is mandatory and all players must pay attention to all pre-game briefings. How does one know when you’re hit? When one is hit by a paintball round, it hurts. The paintballs are large (0.68″ /17.27mm dia), heavy (max 3.2 gramme) and liquid filled. Paintballs are fired at muzzle energies around 6 to 12 times those allowed in airsoft: 16 Joules for rifles and 8 Joules for pistols. To be useful, a paintball has to be strong enough to survive being fired from its gun, yet be travelling fast enough and be fragile enough, to break when it hits it’s target. Paintballs can, and do, leave some really tasty bruises. You certainly know when you have been hit by a paintball. Airsoft BBs are smaller (6mm dia) and lighter (usually 0.20-0.25 gramme up to a max ~0.45 gramme). Muzzle energies are legally limited (due to the recently introduced Policing and Crime Act) to 1.3 joules for fully automatic rifles and 2.5 Joules for single shot/semi auto rifles. In practice most sites set limits lower than the legal maximum. At Tech Brigade we use 1.14 Joules for automatics and 2.3 Joules for single shot / semi auto. The Rules section has more detailed information on power limits. While a BB flies much faster it is much lighter and doesn’t carry anywhere near the kinetic energy of a paintball. A BB can leave a small bruise. They can break unprotected skin and can, and do, break teeth which is why we highly recommend wearing full face protection. At longer ranges BBs wont bruise or break skin. So how do I know I am hit? Usually, you’ll feel the round (or rounds) hit you. If you’ve been hit by BBs from an AEG, the chances are you’re going to be hit by a number of rounds. That feeling is quite unmistakable. You might also hear the person who shot you celebrating in the distance! 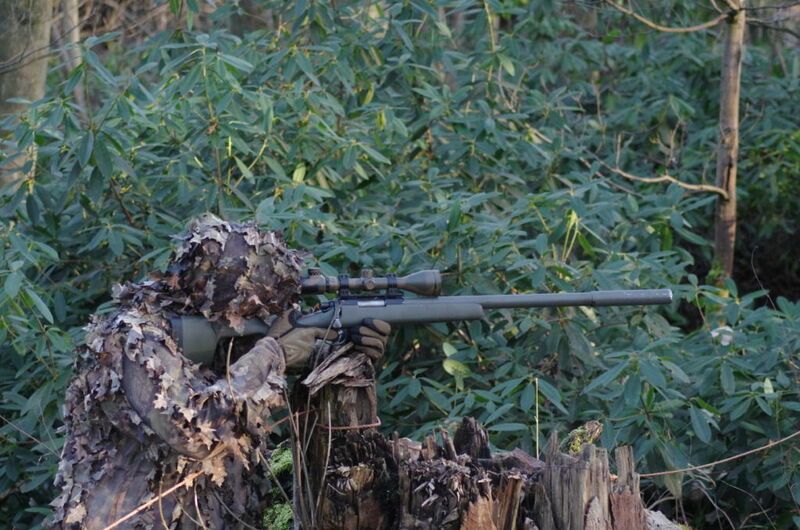 If a sniper round hits you, it will be a single shot, but you will feel it. Some will tell you that it hurts and undeniably, while a paintball round provides a punch, an airsoft round can sting. Not enough to really hurt, but enough to leave you in no doubt you’ve been hit and not to want it to happen again too soon. That said, players often wear various chest rigs or plate carriers or, in cold weather, may have several layers of clothing. This can make it difficult to feel a hit. Also if you are at the far end of the rifle’s range the BB will have lost almost all of it’s kinetic energy and might not make much impact. You may have to rely on hearing the hit which makes a distinctive noise. 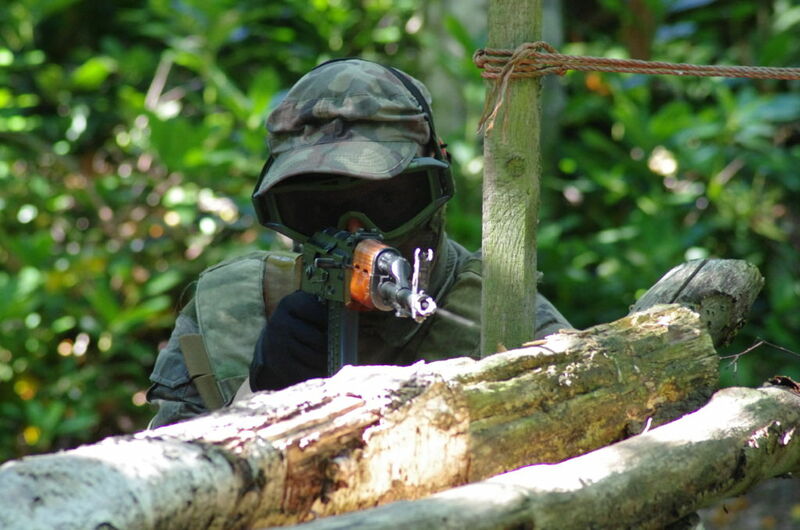 As airsoft is entirely based on honour, reliant on people being honest and calling their hits, if you are uncertain about whether or not you have been hit just call yourself hit. As we operate a re-spawn system you will only be out of the game for as long as it takes you to get back to the re-spawn point and get back in to the fray again. If in doubt call the hit! 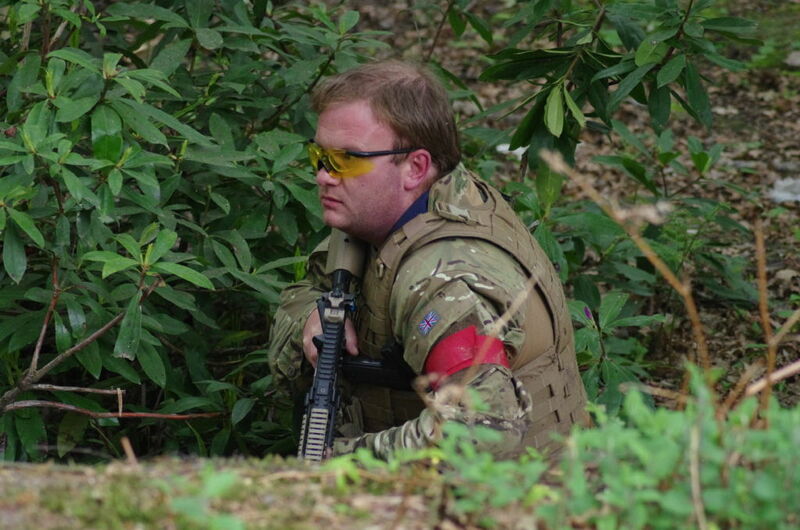 This is where a lot of people new to airsoft have been known to frown a little and look slightly puzzled. When a person is hit, they are expected to own up to it. As there is no paint there is no way to show you are hit so it is down to each player to be honourable and own up to being hit themselves. Traditionally, the shot player shouts, in a clear loud voice, “Hit!” and stands up and raises their gun or free hand above their head. Try to make sure you call your hit quickly and loudly. Bear in mind that the person who shot you is likely to still be firing with a noisy airsoft gun held at their shoulder. So you need to be loud enough for them to hear you from some distance and over the noise of the gun firing next to their head. Once you have called yourself “Hit” immediately walk straight to your re-spawn point continuing to hold your gun or arm above your head. Don’t look around trying to see who shot you or where the shot came from. Don’t talk to anyone, “Dead men don’t talk!”, until you have reached the re-spawn point. Some are tempted not to take their hits. Do bear in mind that the chances are the person who shot you knows the fact and will raise the matter with the person concerned, either at the time or during a break. Players can quickly get a reputation and those who are known not to take their hits might find they are not welcomed in teams, and may find themselves singled out as a target. Isn’t it a bit boring having been hit and waiting for a new game? Which takes us to the next principle, central to the sport. Tech Brigade pioneered the Dead Zone or Re-spawn system. In most games a player gets to live more than once. Both teams have a designated “Dead Zone”. When a player is hit, they go to the Dead Zone. After which they are free to rejoin the game. A wise player might change a battery or top up a magazine during this time. Another game option is the ‘Medic Rule’ where a designated team member can bring you back to life – this would mean that you stay where hit until the medic can reach you. 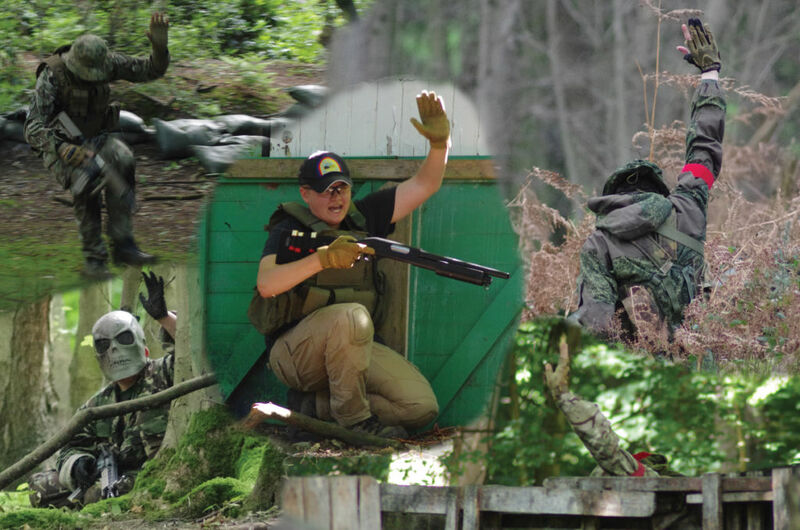 It used to be that most airsoft sites didn’t play the Dead Zone system, but used the paintball-originated Safe Zone system, whereby once you are hit, you retired to a nominated Safe Zone and were out for the remainder of that game. We found that this needed too many marshals to police and was quite disheartening for the new or unlucky player who got hit in the first 20 seconds of a game. These days most skirmish sites use some variation on the Dead Zone or Re-spawn system. So, what games can you play? Airsoft attempts to recreate the thrill of an infantry engagement. Overwhelmingly, these take place in two arenas. The Urban setting and the Woodland setting. In general, the players are split up into two teams. One team, designated the defenders, have to protect an object, building or person. The others have to attack and shoot, secure or “blow up” the objective. Sometimes, it will simply be a war of attrition, kill as many of the other team as you can. King of the Hill relies on holding a set objective whilst a timer counts down. Once the timer has expired, the team at the objective wins. Sometimes a game will have limits on the hardware that can be used. We know them as “Pistol and Pump only” which means, no AEG’s or snipers, or “All Electric” which is self-explanatory. These days these sort of games are played infrequently..
A time limit can be set on a game. This has the effect of controlling the tempo and thereby how the players play the game. On a long game, people will be patient and tactical. In a short game, players will be more mobile and take more risks. “Herman”: A head and shoulders aluminium cut out target which has to be shot to end the game. Flags: Which need to be captured / collected. Battery and the key switched intermediate box / pyrotechnic firing box in pyro box mode to fire a pyrotechnic device. Battery, the key switched intermediate box / pyrotechnic firing box in switched box mode and Alarm box. What’s better, attack or defend? Well, they are very different. When you’re defending you will usually have a nice, dug in, position to defend and be aware of where your comrades are because you are all defending the same position. Your Dead Zone (if those rules are played) will likely be close by, so your hit players can recover quickly. They can work well as a team and benefit from mutual support. But, they don’t know where the attack will come from. Meantime, the attackers have the freedom of the game area and if they are good, they can outflank the defenders. They know more or less where the objective is. But, they are often uncoordinated because they are spread out and their Dead Zone might be a fair distance away. At Tech Brigade, the Gamesmaster will have the attackers out-number the defenders; it makes for a better game. How many games will you play and how long are they? Depending on the game type, a game will typically last between 10 to 60 minutes. Occasionally, a specially organised game will last more than an hour. It’s usual to play games in batches of two or three, without returning to the Safe Zone so players should carry enough ammunition, batteries and gas to cover this. Usually each game session will be one team attacks one defends, then a swap round, then return to to the Safe Zone to reload and tell the stories. How long a day lasts is down to nature and weather! The What happens during the day section has a bit more of a breakdown of the usual TB day. How will I know the game is over? The game objective is achieved by the Attacking force: As in the attackers capture the flag, over run the base, shoot the VIP, locate the hidden items or otherwise complete their goal. In some cases this will involve blowing a whistle, setting off an alarm or firework or hitting a metal target. Either way there will be a noise and a shout of “Game Over!” Usually followed by several blasts of a whistle. On the very rare occasions when players have dug themselves in to a defensive position some distance from where the action is and missed the whistle blowing and shouting we do notice and send out search parties to retrieve our lost comrades. How do I know which side is which? We use coloured armbands to identify which side are the Attackers and which are the Defenders. The Defenders always wear Red armbands. The Attackers don’t usually wear armbands. In some game scenarios we might have three teams. On these occasions we break out the special Blue armbands 😉 . A defending player showing the red defenders armband. Pre-game briefing for the attacking team. 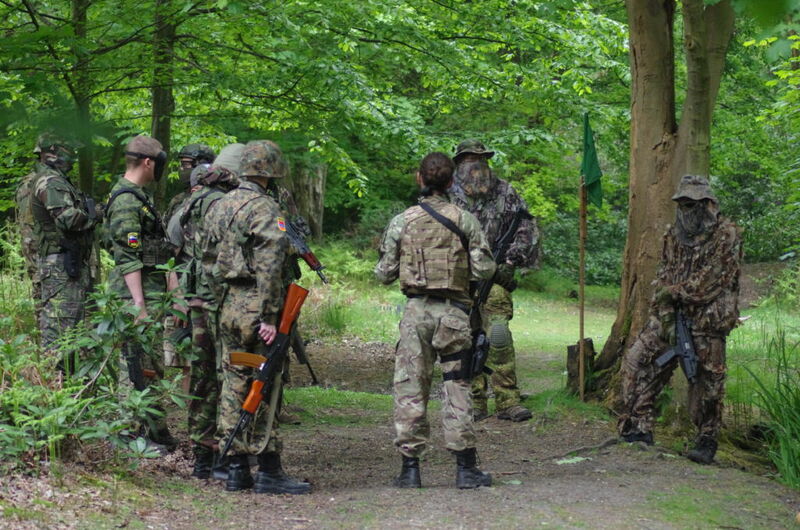 Note the Green flag which is the Re-spawn marker and that none of the players have armbands. Get on to our forum, you will need to register to ask a question, but from then on, we will do all we can to help you.